Olga Breeskin, Mexico's biggest, brightest, buxomest super estrella is honored in this recipe for bacon-wrapped grilled hot dogs. As followers of Spectacularly Delicious will recall, our younger years were spent treading the boards of the wicked, wicked stage. Mexico City's "Super Olga Ochenta y Tres" extravaganza might not be the most wicked credit on our resumé but it certainly ranks near the top. Hot Dogs Super Olga embody the star qualities of the ultima vedette herself: original, sensuous and suggestive. And just like Olga, they are the ultimate crowd pleaser. 1. Wind a strip of bacon (regular, not thick-cut) around each hot dog from stem to stern. Secure both ends with a toothpick. 2. Preheat the grill to 350-400º so the cooking grids are very hot. 3. 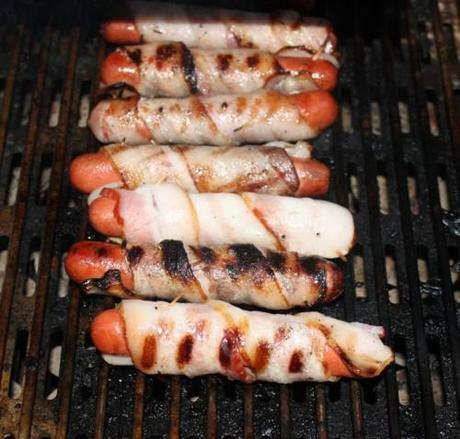 Reduce the flame to low and place the bacon-wrapped dogs on the hot grid. While the hot grids sear the bacon onto the hot dogs, the low heat slows the cooking pace to minimize grease flare-ups. Turn the dogs evenly as you cook over low heat for 10 minutes. 4. While the initial appearance can be a little alarming — smoking black char marks scarring the pinkish white spiral of bacon, the combination of low heat and even turning will result in the bacon adhering to each hot dog as tightly and seductively as one of Olga's form-fitting gowns. 5. IMPORTANT: The protruding parts of the toothpicks will burn away, so it's crucial to remove the remaining toothpicks within each hot dog before serving. 6. 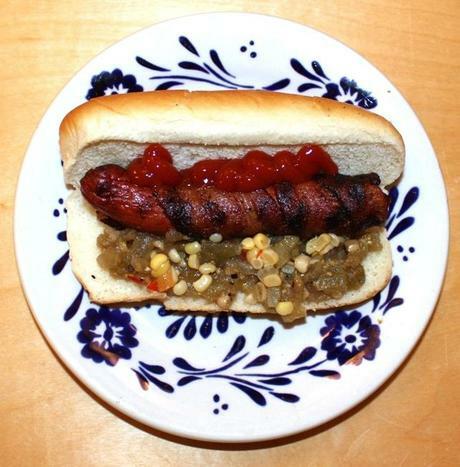 Serve on soft white hot dog buns, dressed with roasted corn and tomatillo salsa and ketchup. Pickled jalapeños are not only welcome, they're encouraged. This photo graced the cover of IMPACTO magazine, Mexico's must-read of that era. While whisper-singing a spicy Spanish translation of Michel Legrand's "Watch What Happens" from The Umbrellas of Cherbourg, Olga created an ever-changing kaleidoscope of feminine beauty. The brightly lit heart was a clever, two-sided ladder with rungs between the heart faces, so as it rotated Olga arranged herself into an ever changing variety of beguiling positions that presented her plush, limber curves to maximum advantage.